EXERCISES FOR THE LOWER BODY Inexpensive equipment is available that makes it possible for you to exercise at home. For some exercises, all you need is a steady chair with a flat seat. The top of the chair should come up to your waist when you stand. The most convenient weight system for the legs is a pouch that has pockets for lead pellets or sand filled weights that vary from 4 oz. to 20 pounds. (A) To strengthen the muscles at the front of your thighs. 1. Sit the rack in a chair with the backs of your knees resting against the chair seat, the weight strap around your ankles. 2. Raise 1 foot in front of you until your leg is a straight as possible. 3. Slowly lower your leg to the starting position. 4. Repeat with your other leg. Alternate legs with each list. 5. When you can perform eight lifts and good form at a high-intensity, increase the weight. (B)To strengthen the muscles in your lower abdomen. 1. 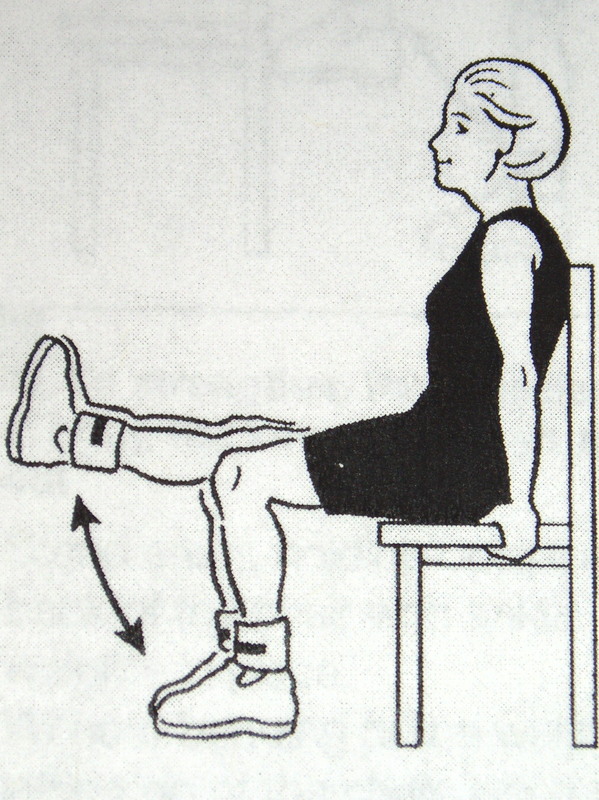 Wearing ankle weights, sit in a chair and slide forward so that only your upper back as resting against the chair back. Hold onto the seat with both hands. 2. Lift both feet two to three inches of the floor, then straighten your legs in front of you, holding them together in the highest position for one to two seconds. 3. Slowly lower your legs back to the starting position. 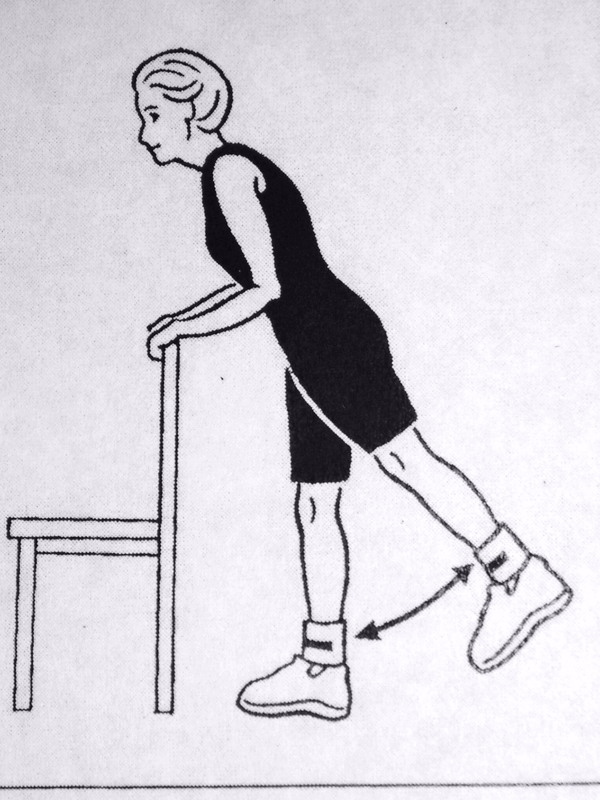 (C) To strengthen the ankle and muscles in the back of the calf. 1. Stand erect, holding onto the back of the chair, ankle weights in place. 2. Raise your body as high as possible on your toes without letting go of the chair. 3. Lower your body slowly to the starting position. 4. Repeat until it becomes hard to continue. (D)To strengthen the muscles in the backs of your thighs. 1. 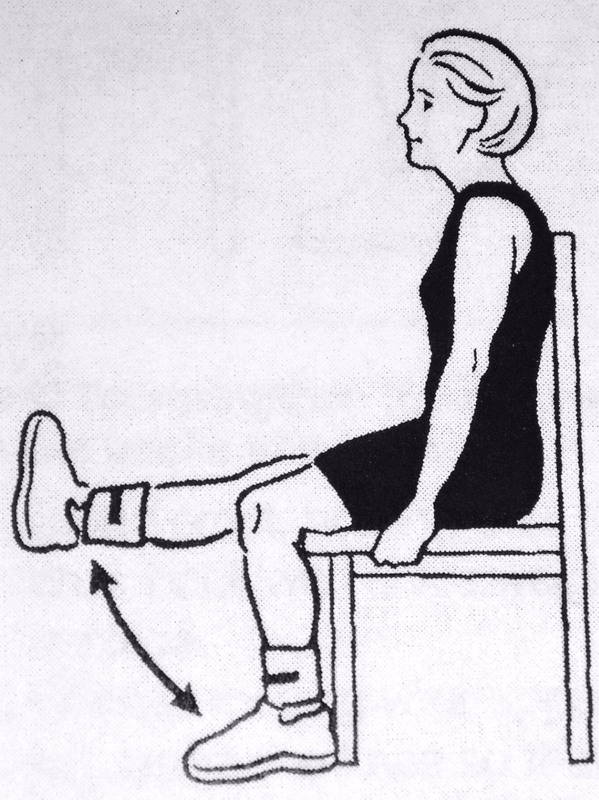 Stand erect, holding onto the chair back with the ankle weights in place. 2. Without moving your upper leg, and won the so that your heel is as close to the back of your thighs possible. 3. Lower your leg to the starting position and repeat, alternating legs. Repeat these exercises twice a day. (F) To strengthen the muscles at the size of your hips and thighs. 1. 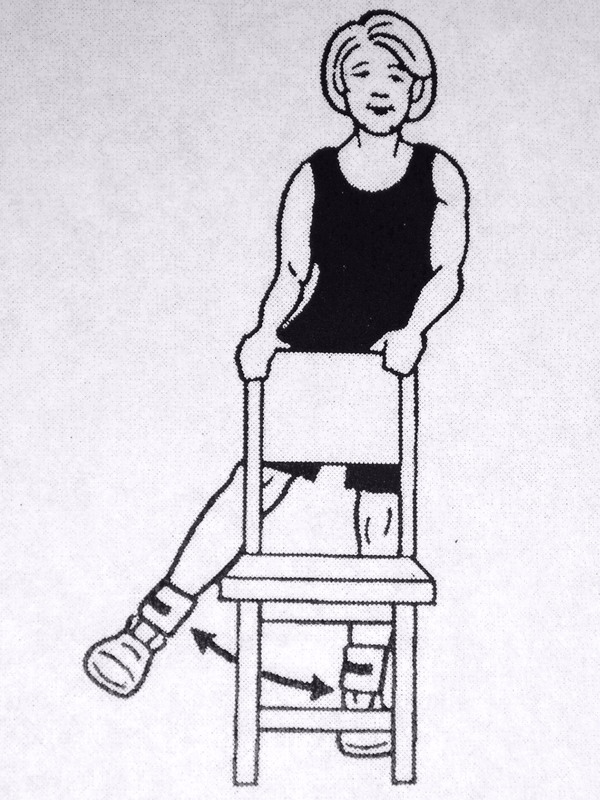 Stand erect, holding onto the chair back with ankle weights in place. 2. Without bending your knee or waist, move one leg straight out to the side, making sure that your toes are always pointing forward. 3. Lower your leg to the starting position and repeat, alternating legs. 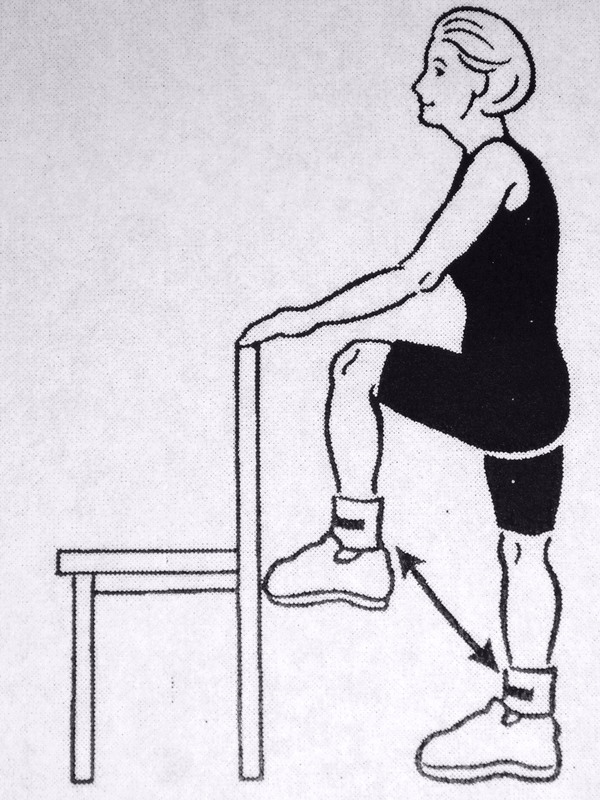 (E)To strengthen the muscles that bring the knee toward your chest. 1. 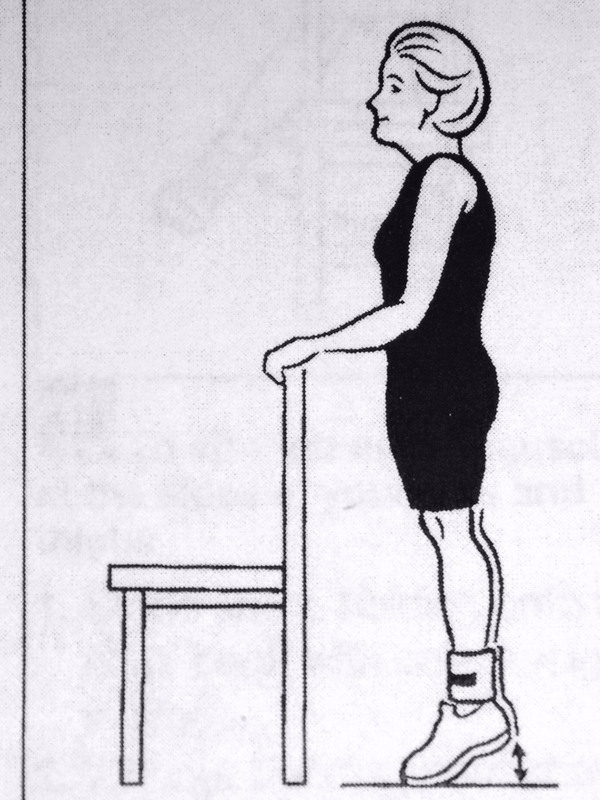 Stand erect, holding onto the back of the chair with ankle weights in place. 2. Without bending at the waist or letting go of the chair, bring one knee at a time as close to your chest as possible. 3. Lower your leg to the starting position and repeat, alternating legs. (G) To strengthen the muscles in your buttocks and lower legs. 1. 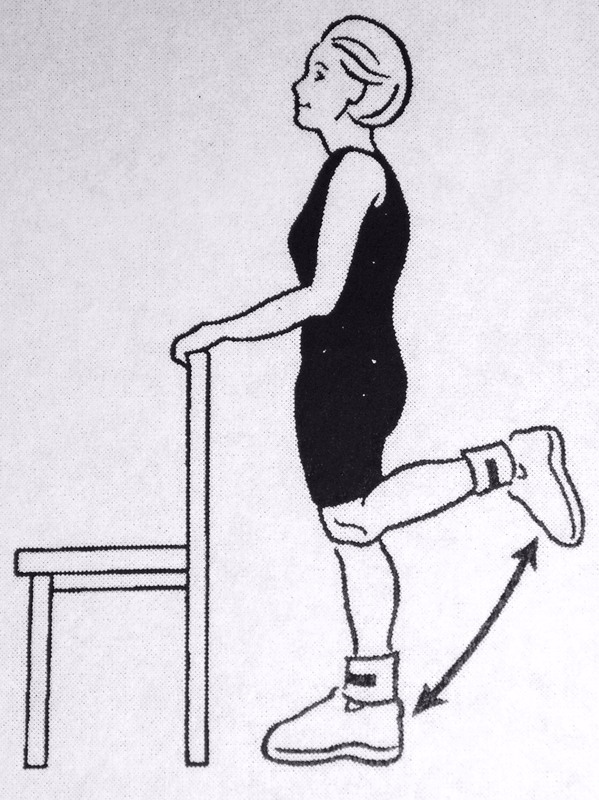 Stand, holding onto the chair back, and and forward and about a 45 degree angle at the waist with ankle weights in place. 2. Lift one leg straight out behind you as high as possible without bending your knee or moving your upper body. 3. Lower your leg to the starting position and repeat, alternating legs.